I was in Los Angeles in January 2019 for a week – and on the way back to Vancouver, I had a burger at The Habit Burger Grill at Los Angeles International Airport (LAX). It was a good thing I checked in fairly early. It literally took 25 minutes for the order to be ready – even though they had said “15 minutes” when I placed the order. I had never heard of this franchise before – but the staff was friendly. The only issue was the speed of the service. After that, it was time to board the flight and return back home! During a little party recently at Moxie’s Grill & Bar on Davie (1160 Davie Street, Vancouver), I had the opportunity to try one of their steak dishes. I opted for the Sirloin & Prawns (C$34), which was a 7-oz sirloin steak with garlic butter prawns and served with potatoes. Personally, I thought the service was excellent. I often got iced tea refills, and the servers were friendly. The steak and potatoes were very filling – especially since I had shared a few appetizers (calamari and dry ribs). I wished the dry ribs had been boneless, but oh well – they were decent enough for me to keep eating them. I must say I regretted getting the prawns – ST beside me had gotten the Mushroom Sirloin and I must say those mushrooms looked more appetizing than my prawns!! Overall, I would say the atmosphere was awesome. Lots of laughter at this little party. The food was great. Same with the service. And oh, from our table I could see the Canucks-Predators NHL game on the big screens. Haha – the Canucks got their butts kicked on this night! Oh yeah!! I was at the Grandview Highway Pizza Hut on a Monday night, wanting to watch the fourth quarter of the Monday Night Football game between Pittsburgh and Cincinnati. Because she was busy, I didn’t get a chance to ask the server if it was possible to change the TV channel until I was halfway through my meal. She said she would ask the manager. I ordered the Meaty Marinara – which was Italian-seasoned meat sauce and rotini pasta topped with pizza mozzarella. The pasta was very filling, especially because it was served with breadsticks and I kept eating those things. Given the fact I’m not a big eater, I couldn’t finish either thing. The TV thing was no issue. I was back five days later on a Saturday evening, and you might expect them to have Hockey Night in Canada on. But no, again it was ABC and they were showing some random program. I said nothing about the TV this time because it was no big deal. I had their Creamy Chicken Alfredo, which was sliced grilled chicken breast tossed with rotini in alfredo sauce. The big deal came when I was about 75% done with my meal. Now, this is not unusual in restaurants, where the server would bring your bill to your table and say, “No rush.” But in this instance when the (same) server brought my bill to my table, I wasn’t pleased because it felt like I was wasting their time and they were rushing me off. It wasn’t as though there were people wanting a table, so I was not pleased. I had thought about getting a dessert to go – I actually was – but since they weren’t welcoming me with this bill nonsense as I was still eating, I decided to forego the dessert. So, I just had the pasta and that was it. It was creamy. Came with toast. It was good. The cubed chicken pieces were plentiful. It was all good. The TV wasn’t a big deal. But rushing me off – or giving me the sense like they were doing that – means I will not be back anytime soon. The one other comment is that on their menu, they had many of their items crossed out with some kind of black marker. Great. A restaurant without a full menu and too cheap to print out new ones. Well, Christmas is a couple of weeks away, so have you bought a gift yet for the sports lover in your family? If not, then why not one of these two books? Hey, this is my blog, so I’m allowed to share a couple of my books here, right? 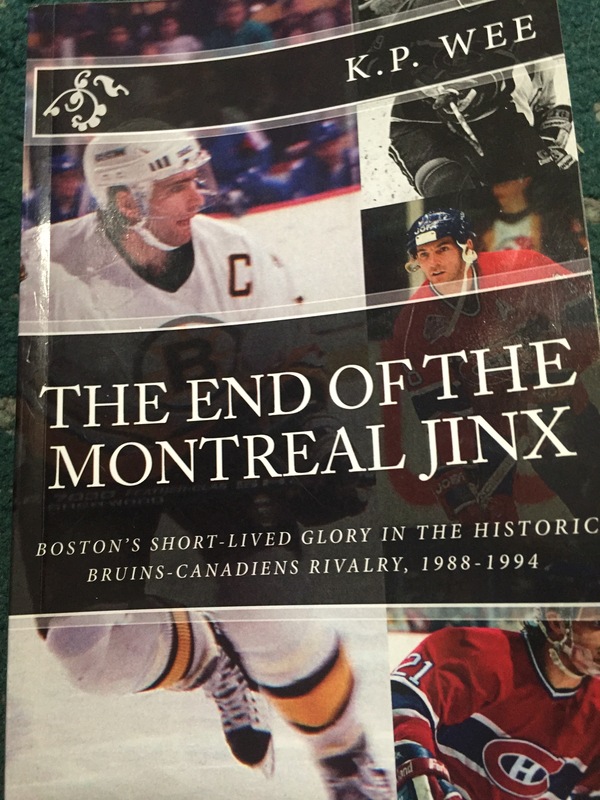 The hockey book is about the Boston-Montreal rivalry from 1988-1994, when the Bruins won five of the six series played between the two clubs, ending a streak of 18 consecutive playoff series losses to the Canadiens. 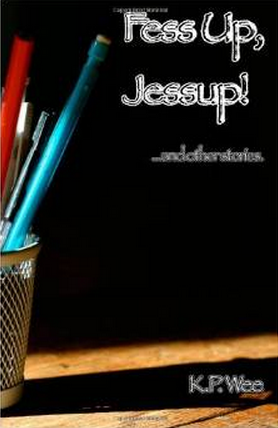 Click to purchase this book here. 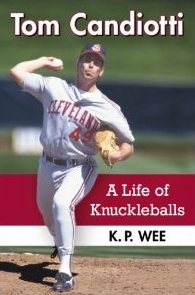 The baseball book is a biography of Tom Candiotti, the former knuckleball pitcher who pitched in the 1980s and 1990s. Candiotti won 151 major-league games and this book highlights his career. You can purchase this book here. I have a buddy who works at The Bimini Public House, so one Sunday evening I went to this Kitsilano pub to check it out. Alas, the buddy wasn’t working that night, but I stayed and ordered their Sausage plate with a Coke. You had a choice two sausages with two mustards, and the plate was served with fries and sauerkraut. I picked the Smoked Jalapeno Cheddar and Heritage Beef Banger sausages with the dijon and stone ground mustards. There were a couple of flatscreens right in front of me – I sat at the bar – and I could see the Pittsburgh-Philadelphia NHL game on NBCSN (haha the Penguins lost!!!!) as well as the local Vancouver-Winnipeg tilt (yawn). Overall, a decent place to catch a ballgame and have some dinner with the game. … And ohhhh, apparently on Sundays, you could play ping pong and pool for free (as indicated on the sandwich board outside).